You are currently browsing the daily archive for June 26, 2011. In May 2009 we thought the Terrorist Tigers had been vanquished. Mr Prabhakaran was dead, along with many of his fighting cadres, and most of the rest had surrendered. It was true that some had got away in the preceding months, and a few more managed to escape, but these by and large made their way out of the country. Sri Lanka itself seemed free of terror and terrorist activities. Though the remnants of the LTTE abroad continued to stick to their original agenda, it seemed that resurrection of the movement that had wreaked so much damage was unlikely. Recently however there are signs that the movement feels it has got a new lease of life. Taking advantage of what it sees as the vulnerability of the Sri Lankan government to international pressure, it has also endeavoured to convince the majority of the Tamil people abroad that the LTTE agenda can be revived. Most worryingly, it is also trying to stir dissension amongst Tamils in Sri Lanka, who would much rather work together with the rest of the country to ensure rehabilitation and reconciliation. The strength of the old LTTE identity in other countries struck me, watching the one but last Harry Potter film, as arising from the dividing up of the LTTE persona in the way in which the evil Lord Voldemort had divided up his soul and stored the parts in seven horcruxes all over the world. While the list may not be exhaustive, we can see then the way in which LTTE rumps, in Britain and France and Canada and the United States and Australia and South Africa and India, have tried hard to make sure that their destructive agenda dominates discourse in those countries. Once one realized how similar the LTTE was to Voldemort, the parallels flowed thick and fast. 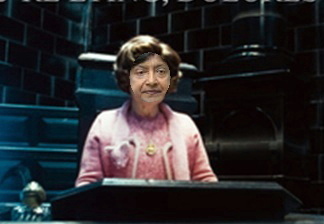 We have for instance Navanethem Pillay, who behaves exactly as Dolores Umbridge did, who was supposed to teach students to defend against the Dark Arts in the fifth Harry Potter book. What she did instead was to bully the decent people in her class, making them for instance torture themselves by a gruesome form of self confession, carving an admission of guilt into their own palms. So too Navenethem Pillay, instead of worrying about terrorism and real evil, uses her position as UN High Commissioner for Human Rights to humiliate those who provided the best defence against terror.